Oh, good heavens. 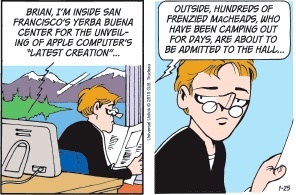 It looks as though Garry Trudeau is doing a whole week’s worth of strips about the Apple Tablet event this week in San Francisco. To clarify: one of the most popular strips in the world is doing an entire week’s worth of comic strips about an event in which a rumored (rumored) consumer product might (might) be shown off for the first time. I think we now need to create a new word for “hype” that only refers to the sort of buzz that an Apple product can generate. At this stage, the only way for the Apple tablet to get more press would be if it got into a car crash after its wife beat it with a golf club. What a gorgeously-drawn strip. And that’s been a consistent feature of the thing. Every character has a distinctive appearance. Everything’s drawn with an economy of line that communicates clearly, yet omits no necessary details. Characters have solid anatomy. The artist is a good “director,” choosing his shots well to communicate the story, and he gets good performances out of his actors. Even the “cinematography” is top-notch. Pay attention to how this strip is lit and colored. Given the current state of the print biz and the comics page thereon, I have to think that the colorist is working with the online edition in mind instead of the limited range of soybeans smeared across mashed-up trees. Which brings up a question: given that a comic strip pubished online can be any size or dimensions…why do most newspapers’ sites scale them down? This JPEG was copied from the Seattle Pi comics page, which is where I read “Winkerbean” every morning. I had to scale it up here on my MacBook to make sure y’all could see the strip for what it is. Even at with the upsampled resolution artifacts, it “reads” so much better at a thousand pixels wide. There are a couple of subscription services that’ll put all of your comics on one page. The trouble is that the user interface isn’t great and if they’re missing just a few of your favorites…well, what’s the point? You might as well save yourself some money and keep visiting three different newspaper sites every day (in my case: Seattle Pi, Yahoo!, and the Houston Chronicle). You’re still forced to make side-trips for webcomics like PVP, Girls With Slingshots, and XKCD. It’s funny how the wheel keeps turning around. A hundred years ago, the comics page was hotly-contested property. The right collection of strips sold papers, period. And the comics page reflected that. They were printed big, with plenty of landscape for artists to play in and enough room for dialogue. You didn’t cheap out on the printing or production, either. Newspapers are in no danger of dying off. Anyone who tells you differently is trying to sell you a timeshare or the digital equivalent: trying to line up angel funding for yet another social news bookmarking service. But the industry needs to adapt to the new currency of readership. And here, comic strips can fulfill their traditional role by being the thing that brought you to the paper in the first place. Comics aren’t the answer. But a smart newspaper will invest in improving their comics infrastructure. I want a system that displays full-color comics at high resolution using a helpful but inobtrusive Flash player that takes me through all of my favorite strips (skipping over “The Lockhorns,” “Momma,” etc.). The paper that commissions such a system, and makes it easy for me to send people to their site by blogging about today’s “Funky Winkerbean” or emaiing a link to last week’s “Peanuts” to a friend, will do very well.